Combine mayonnaise and sour cream in large bowl. Add salad seasoning (like McCormick brand), sugar, and lemon juice to mixture. Mix well. Fold in pasta and vegetables into the dressing mixture, and mix well. This is a great base, but it needs some additional seasonings, at least a little salt and pepper. A delicious seafood pasta of clams. 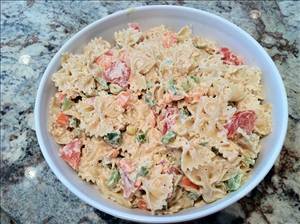 There are 195 calories in 1 serving of Creamy Farfalle Salad. Calorie break-down: 29% fat, 54% carbs, 17% protein.